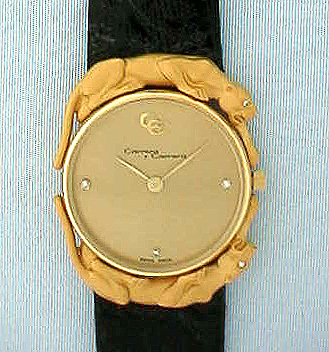 Unusual Carrera 18K gold and diamond wrist watch, new old stock, circa 1995.The case flanked by two well rendered panthers with diamond set eyes front and back.Dial with diamond markers. Old stock in new unused condition with original tie tag. Quartz movement.Very showy and quite handsome. A men's watch that would also look wonderful on a woman. Estimated retail $8,000.